Have You Considered Cool Roofing? West Coast Roofing in Portland provides the highest quality cool roofing membranes for your home's roof. For homes with low-slope roofs, a new cool roofing solution provides many years of great protection, while saving you money on heating and cooling bills. A cool roof can also help eliminate the hot-spots in your home that make it difficult to cool. A cool roof reflects the sun's rays back away from your building. With darker roof systems, your roof will expand and contract as it heats and cools during the average day. This expansion and contraction weakens seams and penetration points and will shorten the life of any roof. By reducing the thermal shock your roof experiences every day, your new cool roof will lengthen the life of your roof, while saving you money on energy usage. 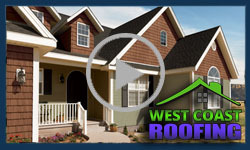 West Coast Roofing serves all of Portland and surrounding areas. Call us today for a free assessment of your roof's needs and potential.